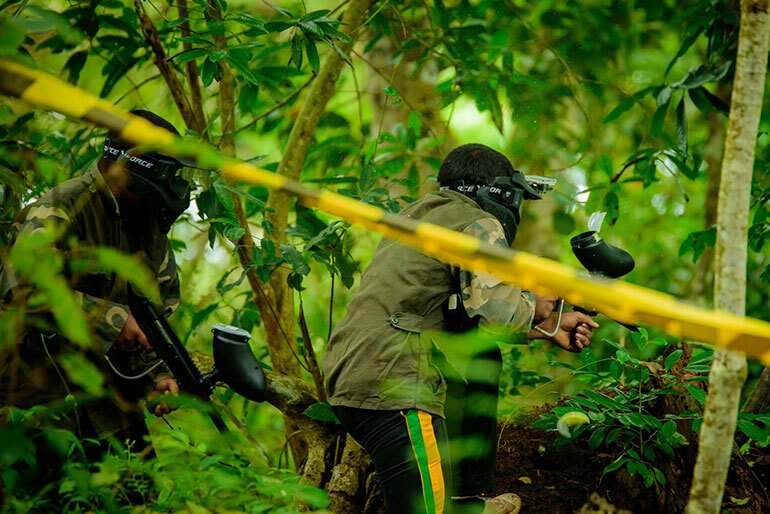 It is an intense game, considering the fact that you’re armed with a mask, ammunition and a Paintball marker, but Paintball is actually a fun, interactive way to build teamwork and get some exercise. Of course, the Paintball gun is loaded with gelatine shells filled with a type of paint that marks a person or object when hit, so it’s an experience that will leave you covered in colour! When you play Paintball you experience an incredible cardiovascular workout that boosts your endurance levels because of the extended amount of time spent on the field. Paintball is primarily a team sport, which requires some amount of strategy and execution that can be done only when all the players work together as a team. It promotes team spirit and can also improve your leadership skills. Tense situations in the game often bring out the best in many players and boost their self-confidence. Playing a rough game of Paintball is one of the best ways to vent out your frustration without risking hurting others. Sometimes, venting your anger in the game can also help you improve your skills as a Paintball player. The endorphins released during intense exercise also eliminate mental stress and bring a sense of calm. Good teamwork is essential in Paintball – your team must work together to make strategies and plans, and then be able to coordinate them. If you’re lacking a bit of teamwork in your office, why not arrange a day out with your colleagues and put yourselves to the test? Working out outdoors actually boosts your mood, outlook, focus and immunity. According to a study from the University of Michigan, group nature walks are linked to enhanced mental health and positivity, as well as significantly lower levels of depression and feelings of stress. A study from Glasgow University showed that people who walk, bike, or run in nature had a lower risk of poor mental health than people who work out indoors. Finally, who can say that having a bit of fun isn’t one of the major health benefits of Paintball? The rush of adrenaline sparked by just running around and shooting opponents with pellets of dye brings back the inner child in us. Full of laughter and excitement, Paintball makes a truly brilliant day out with friends. ONE FOUR BASE Paintball is AWESOME!!! they have the best Paintball battlefield in Sri Lanka. we had a lot of fun. the staff is very friendly and their services is excellent! Madhushan is a well experienced entrepreneur who has over 10 years at Sri Lankan army and over 10 years at Sri Lankan corporate sector. He was awarded as the “Best HR Practitioner” in 2012 by the Institute of Personnel Management. How To Improve Your Paintball Aim And Accuracy? Subscribe to our Newsletter to get the latest news and special offers directly to your inbox. Madakada, Bope, Padukka, Sri Lanka. © ONE FOUR BASE - 2019. All Rights Reserved.